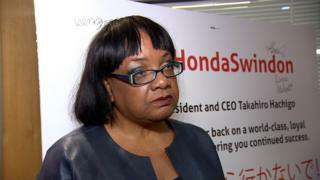 Shadow home secretary Diane Abbott has joined the campaign to save Swindon's Honda car plant. Honda confirmed it will close the plant in 2021, with the loss of about 3,500 jobs but insisted it had "nothing to do with Brexit". Ms Abbott said she had "no doubt Brexit was a big factor". Honda has said the move is due to global changes in the car industry and the need to launch electric vehicles, and it has nothing to do with Brexit. However, Ms Abbott said while the issue was "complicated"... "the British people and British workers are paying a big price for chaotic Brexit". She said: "It's not just the job losses in the plant but it is the supply chain which is going to mean thousands of job losses from as far afield as Sunderland and Wales. "It's going to be a big impact and people need to understand that." The Japanese company builds 160,000 Honda Civics a year in Swindon, its only car factory in the EU.